I was using silver bowls, spoons, plates & cups to feed my little one until she is 1. My grandma and my mom insisted me to use only silver. I used to think what is in it and why they are forcing me a lot. 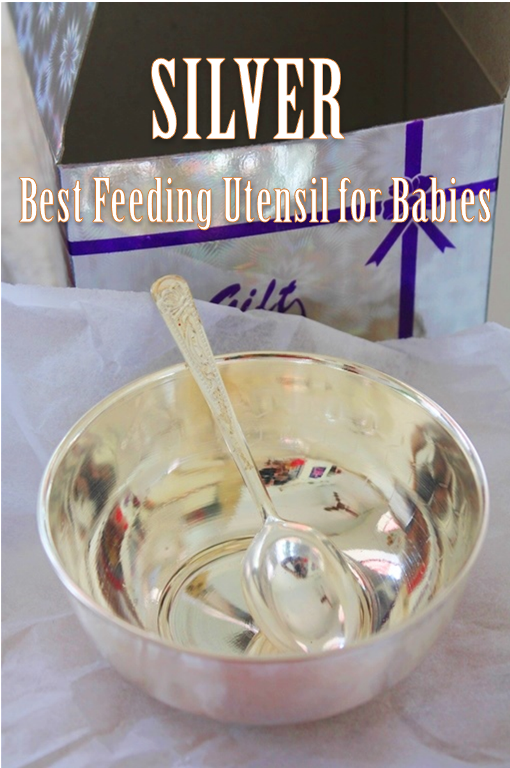 So i researched about it and i came across so many health and medicinal benefits of silver utensils. Today we went to visit my hubby's friends house for his daughters annaprasana, we call it as choru ooturathu or Annaprasana. I will write a separate post regarding this function. Now a few pics from maha's annaprasana. Okay, now back to the story. We bought silver bowl and spoon for the baby annaprasana. 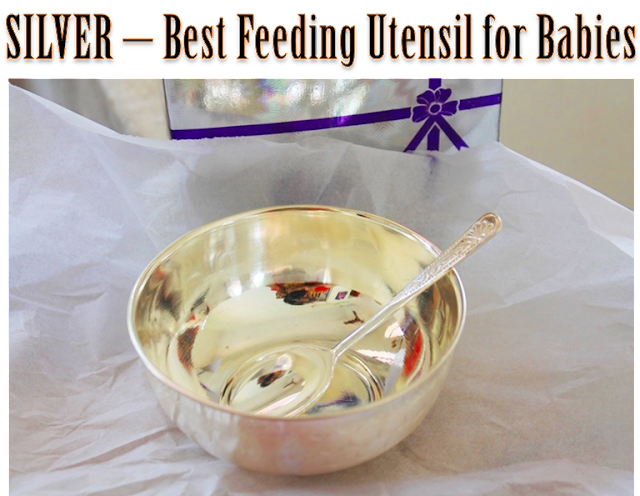 I took a picture of that before giving the gift, because i thought of writing a article regarding silver utensil for baby. 1)It is naturally bacteria free. So sterlizing is not necessary. Washing it in normal water or hot water is enough. Silverware kills bad bacteria. In ancient time they store water and foods in silverware, this makes the water much pure. 2) There is a saying, food absorbs the properties of the vessel in which it is served. The warm food absorbs the nutrients from the metals. Thats why drinking water in copper tumblers is a habit of many. Because copper has so many health benefits in them. Same goes to silver, Silver naturally cools our body and keeps food fresh for long time and it boost babies immunity. 3)Silver is the best antibiotic to mankind. 4)It heals wounds with its anti microbial properties. Facts: Siver coins were thrown in holy water near temples because it purifies the water. Silver coins are added into milk olden days, this keeps the milk stay fresh longer. Only now they are using plastic feeding bottles for baby. But in the earlier days they use paaladai or changu for feeding milk and medicines. So it is really best to use silverware for babies instead of plastic bowls and feeding bottles, even though it says BPA free & High grade. 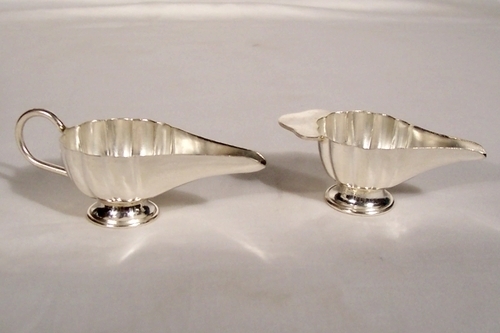 Silverware is quite expensive, but it will surely last lifelong. Hello... Jus a small clarification here.. U had mentioned sayin copper has gud health benefits.. Can it be used oly for water or for all other food items as well?? Hi may i know where can we get silverware in Singapore? Would love to get a set for my lo!